Sure, the Burj Dubai tower looks amazingly tall, but it's final height— currently projected to be 2,300 feet— is less than half that of a new building planned for Saudi Arabia. 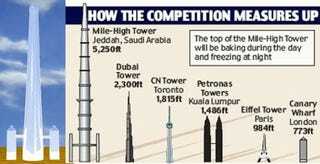 It's going to be 5,250 feet high. Yup, that's just 30 feet short of a mile tall: taller than anything under construction anywhere, and making it easily the world's tallest building. Think they should stick a TV antenna on the top and go for that extra 30 feet? I sure do. It's going to be built in a new city near Jeddah on the Red Sea and is funded by billionaire Prince al-Walid bin Talal. He bought London's Savoy hotel for a cool $2.5 billion in 2005. So you can suspect that there'll be a hotel in the building somewhere. By my calculations, the tower will have somewhere between 320 and 350 floors, so perhaps that should be "several hotels". Not much is known about the details yet, other than the fact that it'll have two supporting flying-buttress towers to help keep it up (both more than 800 feet high). It will also have advanced damping systems to stop the swaying at high floors from making people sick, and it's going to need amazing engineering to cope with freezing wind at the top and desert heat at the bottom.